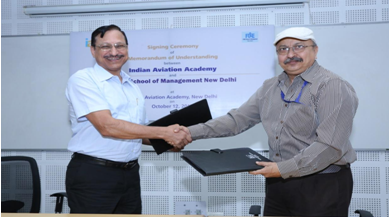 New Delhi: FORE School of management, New Delhi, signed an MOU with Indian Aviation Academy (Airports Authority of India) to conduct Management Development Programs for AAI and launch joint training programs with IAA. The MOU was signed by Dr. Dewakar Goel, Director (IAA) and Prof. Vinay Dutta, Officiating Director (FORE). FORE is one of the few B-schools in the country shortlisted by IAA for this purpose. The MOU was signed on 12th of October 2017 and is valid for two years. Indian Aviation Academy (IAA), the joint training academy of Airports Authority of India (AAI) Director General of Civil Aviation (DGCA) and Bureau of Civil Aviation Security (BCAS) has been set up under the aegis of NIAMAR-Society on 22nd July 2010. It aims to provide education, training and research in the field of aviation management, in ASIA-PACIFIC Region. The IAA has three organizations under its arch – Director General Civil Aviation (DGCA); Bureau of Civil Aviation Security (BCAS) and Airports Authority of India (AAI) and is a pioneer institute in imparting training in Airport Management, Airport Operations, Aviation Security and Aviation engineering. It has also diversified by collaborating with ICAO, ACI, IATA for various courses and plans to undertake more relevant courses of international standards. FORE School of Management, Delhi has been the other pioneer in the field of designing, developing and conducting innovative executive education and management development programmes for working professionals for over three decades now. According to Dr. Jitendra K Das, Director FORE, “Lot of research, TNA or training & need analysis and innovation goes into developing and customizing quality training programs at FORE, where output and the ROTI or Return on Training Investments is taken into considerations at micro level. The key objectives of the programs always have been to impart hands on knowledge and learning based on ‘Ecological Intelligence’ enabling individuals to develop themselves by sharpening their functional and management skill sets which ultimately leads to inspirational leadership and organizational competency building”. Among a range of functional, managerial and leadership development programs, crisis communications, enterprise risk management, developing entrepreneurial mind sets are some of the popular programs offered by FORE to professionals at various levels across verticals like – BFSI, PSUs, Manufacturing, Pharma, High Commissions, Technology, IT & ITeS, Power and Infrastructure, hospitality, and others. Details of the MDP and executive programs offered by FORE can be obtained from http://www.fsm.ac.in/man_overview.html. Applications for the Two-year Full-time PGDM and PGDM IB are open at present and can be applied online at www.fsm.ac.in.